I’ve been wanting to write about this since months ago but never actually set aside some time to sit at a quiet place and do some self-reflection. The irony is that I haven’t been involved in anything important but I’ve been using the time to read and learn something new insha’Allah. You know how we keep on saying that ‘Don’t judge Islam by people’s behaviour; Islam is perfect but Muslims are not’ and we try to emphasize that the focus should be on its teachings only? I can’t help but say that as much as this is true since Muslims are not perfect themselves, ultimately it is not always the case in reality. Whether we like it or not, people will judge our religion according to the way we behave and how we treat others unless they are able to separate between the fact and reality. But how many people are able to do just that? Honestly speaking, even I sometimes question if the reason for that person’s behaviour is influenced by their religion. For example when I read about the situation in Syria, I wonder if this is from the teachings of the Alawites. And the same is true about the Buddhist in Myanmar who are killing and ousting our Muslims brothers and sisters from their land. Why I’m writing about this is that I had an interesting conversation with a sister couple of months back about how we formulate our perception according to our experience with other people. She was brought up in a family that did not have a strong Islamic background so she only started practising Islam when she was studying at the current university that I’m in (which has great emphasis on Islamic studies even if you are not undertaking an Islamic course). When you are an undergraduate, you are required to take some subjects on Islamic studies and you will also be tested on your recitation of the Qur’an (according to what I was told since this doesn’t apply for postgrads). As for the sister, she doesn’t know how to recite Qur’an well enough to pass the test. Her teacher didn’t understand that not everyone was brought up with Islam and as a result she was constantly reprimanded and criticized. After years of being treated with contempt by her teacher, she developed a strong dislike for religious people because according to her, they look down on those who are not as practising as them. She sounded disgusted when she spoke about these ‘religious people’ because she perceives them as ‘thinking they are better than others’ and for ‘being a hypocrite because they only appear religious but don’t behave like one’. I can only empathise with her and agree that the reason why she feels that way is because of how she was treated in the first place. I can also understand because the same happened to me in my madrasah when I was young. An ustadhah we had would always march in our classroom angry and flustered for god-knows-why. She would not only hit us for making a mistake in our Arabic, but called us names like ‘stupid’ and ‘dumb’. She eventually left the madrasah but that created quite an impression on me (she was not the only one who gave me a bad impression btw). Later on in my teenage years, I chose to stay away from religious people because of the perception that they were hypocrites. What we don’t realize is that as much as we stress on the importance of gaining knowledge, we forget that the same amount of importance should be placed on improving and cultivating our akhlaq. Yes, it is our responsibility as Muslims to learn the finer points of our religion (e.g. understanding fiqh of salaah, fasting) but it is also our duty to study about our Prophet sallallahu alayhi salam who is the best example and strive to emulate him. In Qur’an itself, there are constant reminders in many suraahs on how we should treat one another (e.g. look at Suraah Hujuraat). We must remember that our relationship is not with Allah SWT alone but with other humans too: ‘Hablum Minallah wa Hablum Minannas’. When we call ourselves Muslims and dress like one, remember that inevitably, there will be some people out there who are not able to differentiate from ‘teachings of religion’ and ‘the followers of religion’. Somehow it is always assumed to have correlation with each other. Our akhlaq is also part of our da’wah to other non-Muslims AND Muslims alike so its important that we watch how we behave and treat others. Don’t be the reason that cause others to reject Islam/have a bad impression on Islam or for other Muslims to run away from us. Be the reason that when others look as us, they are drawn to Islam and its beautiful teachings. I watched a video on ‘Types of Friends mentioned in Qur’an’ by Bro. Nouman Ali Khan recently and wanted to write a brief summary of the lecture. Instead, I found this picture which encapsulates all the points mentioned! Masha’Allah, really useful! 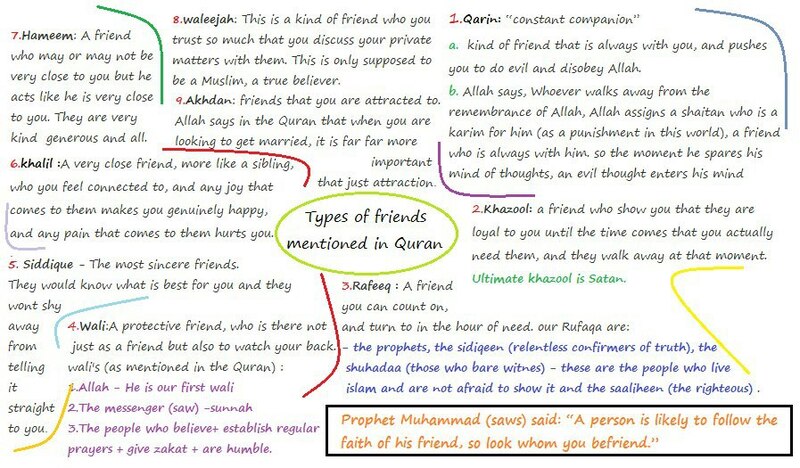 I didn’t know Allah SWT speaks of types of friends in Qur’an. Anyway, if you have time, watch the lecture too! Take a look at this video! This is the proper way of slaughtering compared to how it’s performed in some parts of the world which claim to do the Islamic way but it’s just pure cruelty.